Phase 1: Measure out four ounces of Castor Oil into your bottle, then combine it with 1 tablespoon of Dawn. Fill the rest of the bottle with water and shake vigorously until mixed. Phase 2: Attach the bottle to your hose and coat your lawn. Depending on the size, you may have to coat in sections, be generous. Now is not the time to be stingy with your Dawn. Phase 3: If you have visible mole holes that give you the creeps…as well they should, fill the hole with dirt and drench the new mound with the magic mixture. Phase 4: Mark your calendar and repeat Phases 1, 2, 3 after one week. Consider this the moles’ final eviction notice. Some may have dispersed, but others are a bit more resistant to the idea of digging new holes elsewhere. 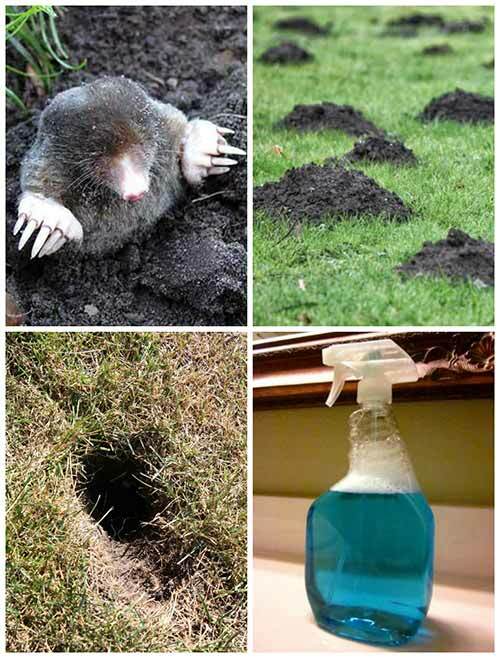 Saturating your lawn a second time ensures your moles will no longer be your moles. While there are other ways to rid yourselves of these vermin, this particular way still allows your pets, your kids, and you to roam freely in your own yard without fear of walking over poison. Plus, doing the job yourself will save you money, lots of money and you get the satisfaction of taking care of your home, yourself. Kudos to you! Thanks for checking out our “How To Get Rid Of Any Burrowing Animals With This Dawn Soap Solution” article. If you found it useful please consider sharing it on Facebook and pinning it to your relevant Pinterest boards, this will help spread the word and help hundreds of people see this info too. See you on the next one!